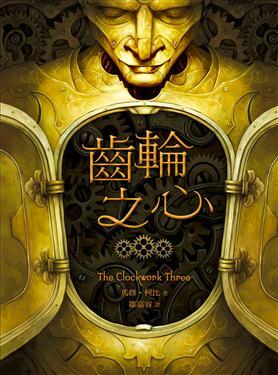 The Clockwork Three has sold in several foreign languages, thanks to the hard work and enthusiasm of Scholastic’s Foreign Rights team. One of those languages is Complex Chinese, and I thought the cover looked so cool I wanted to share. Pretty neat, eh? I’m glad they stayed with the original artwork. According to Google Translate, the title of my book in Chinese is “Gear of the heart,” which is really quite poetic. An online retailer has set up a gorgeous web-page here, if you want to check it out (although it is sometimes unavailable). Anyone read Complex Chinese? For those living in the Orem/Provo area, I’ll be at the Orem Barnes & Noble signing books from 5:30-8:30. Come on by and say hi! Some of you may have listened to the audiobook version of The Clockwork Three. Marc Thompson did an amazing job bringing all the characters to life, and for many of them, his interpretation sounded almost exactly like the voices I heard in my mind as I wrote the book. Well, I wanted to post another review of The Clockwork Three, but this one’s not for me. It’s for Marc, and he deserves all the praise that comes his way. Marc Thompson gives distinct, youthful voices to each of three children–Giuseppe, an orphaned street musician; Frederick, an apprentice clockmaker; and Hannah, a hotel maid–whose lives in a fictional American port city in the late nineteenth century become linked as each strives to achieve a better life. Thompson’s narration smoothly makes believable the transition from the children’s separate stories to their shared adventure as they solve the mystery of a hidden treasure–complete with steampunk elements involving a clockwork automaton with the heart of a golem, who becomes their protector. Thompson’s stellar performance of a tale with a host of interesting characters and plot twists is a most satisfying listening experience. And one final note. I’ll soon be posting a synopsis of my new novel, Icefall, so be sure to check back for that. 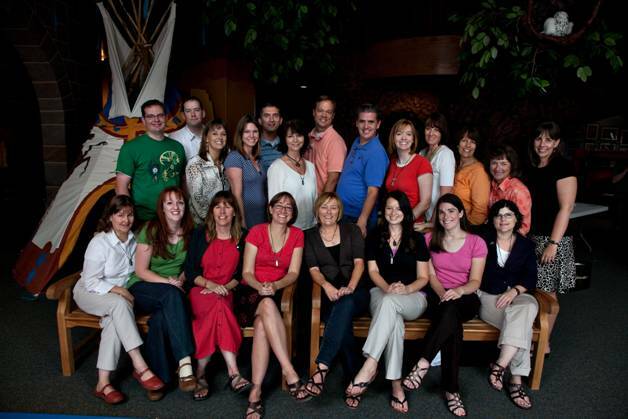 If I was a better blogger, you would already know about the 2010 Writing for Charity event. And unfortunately, this is not a case of better-late-than-never, because you really don’t want to miss this. It’s coming up this Saturday, on August 21. Last year, I participated in the Writing for Charity event held at the Treehouse Museum in Ogden, Utah, and it was a great experience. The atmosphere was so fun and congenial and supportive for everyone involved. This year won’t be any different. As with last year, there will be panels organized by genre (picture book, contemporary, fantasy, etc. ), followed by mini workshops where aspiring writers will have the opportunity to have their work critiqued by a nationally published author. Lunch will be provided, and the conference will last most of the day. But this year, they’ve added an awesome evening extravaganza. In addition to music and improv comedy, authors Brandon Mull, Shannon Hale, Brandon Sanderson, Sara Zarr, Ally Condie, James Dashner, Bree Despain, and Jessica Day George will be on a panel taking audience questions and being thoroughly entertaining. You can attend one or both events. And here’s the thing. As with previous Writing for Charity events, all procedes go to charitable causes. All the writers involved have donated their time, which is an amazing thing and shows how wonderful our Utah writers are. This year, the event is focusing on putting books in the hands of kids. 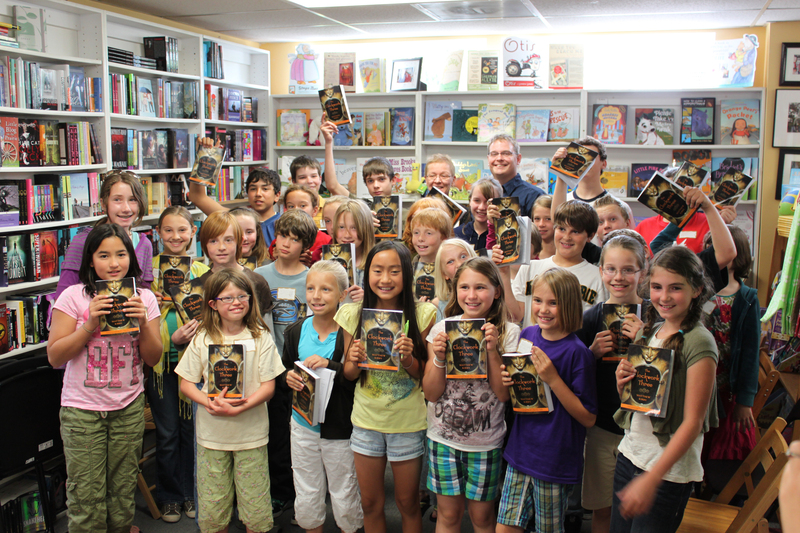 For every conference registration fee received, an entire class in an under-priveleged school will receive books. That’s right. Not only can you have a great time and learn a lot at the conference, but you’ll also know that you have provided each child in a classroom with a book of their own. There is also a silent auction going on to raise even more money for charity. Lots of great items have been donated, but I wanted to tell you about one in particular. My agent, Stephen Fraser, has graciously donated a 10-page critique of a manuscript. Ten whole pages critiqued by a literary agent. You should know that before he became an agent, Steve worked as an editor at such publishing houses as Scholastic, Simon and Schuster, and HarperCollins. So a critique from him truly is an opportunity. You can register for the event online here. You can also just come to the event and register that day. And check out the silent auction here, which also includes items such as a lunch with Brandon Mull, being fictionally murdered in Dan Well’s next novel, or being publicly extolled and raved about on Shannon Hales’ blog. Tell me that’s not cool. 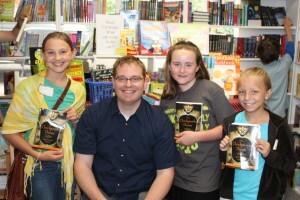 Last week I went to a book group at The King’s English in Salt Lake City. I’ve said it before, but it’s worth repeating over and over that The King’s English is a wonderful bookstore. I wish I lived closer to Salt Lake because I would love to browse and shop there more than I am able to. 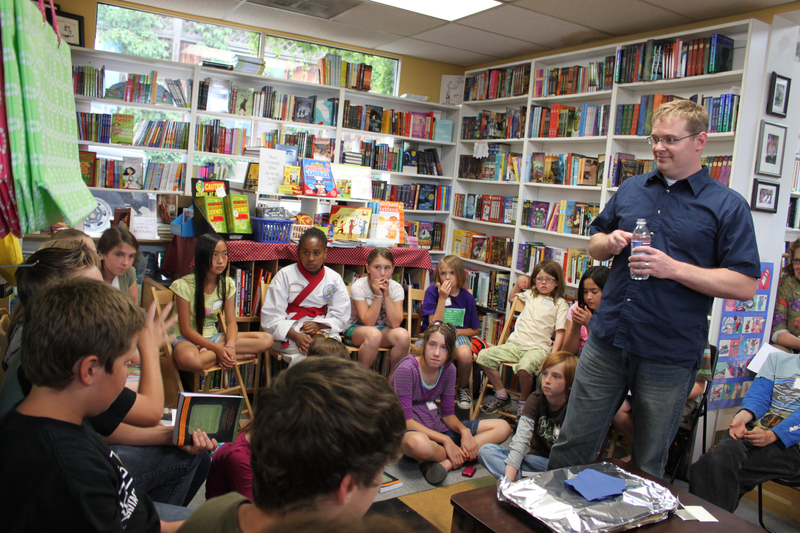 The book group consisted of over 30 young readers who had been given an ARC of The Clockwork Three, and what an amazing group they were. I was so impressed by their insights, their perspectives, and how articulately they shared their thoughts. It’s energizing to be around people who love to read, who find books exciting and magical. 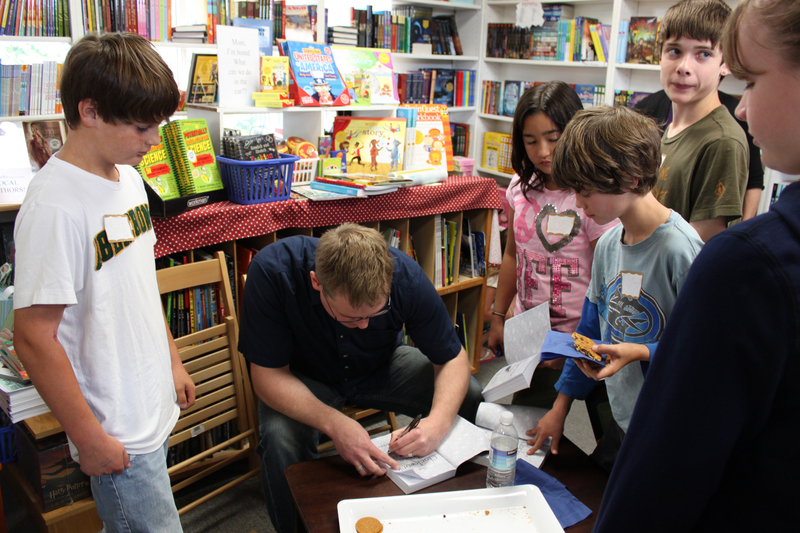 The enthusiasm in those young readers was infectious, and a part of me didn’t really care what book they were talking about. It was just inspiring to see them so engaged in reading. Of course, an even bigger part of me was thrilled by the fact that they were talking about my book. Up to this point, those who have read The Clockwork Three have been mostly adults, so I was a little nervous going into a group of young readers. They are, after all, my audience. But it didn’t take long to settle in, and I was soon having a blast. The feedback I received felt really good. 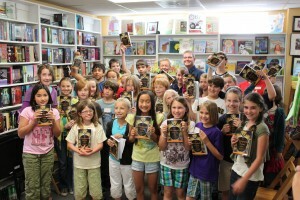 They enjoyed the book, which made me very, very happy. Of course, they didn’t pull any punches when it came to things they didn’t agree with, or didn’t like, and I really appreciate and respect that. But overall the response was very positive. I spent a lot of time answering their questions, and then I asked a few of my own. Which character was their favorite? What was their favorite scene? And a few others that would be a little too spoilerish to mention. 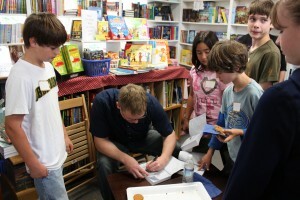 We spent about an hour discussing the book, and then I signed all of their ARCs. It was a wonderful experience. 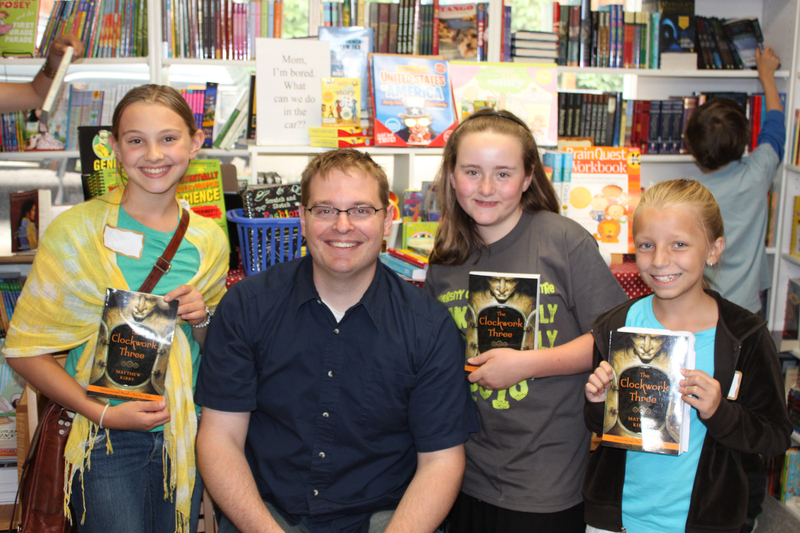 I owe a big thank you to Anne and Margaret of The King’s English, and also Chris, our Scholastic sales rep. They put together a great event. A little while ago, I posted about the Writing for Charity Event at the Treehouse Children’s Museum in Ogden, Utah. I was invited to take part in the workshop as a debut author, and I think I was the “newest” writer at the event. It also happened to be my first time participating in something like this as a presenter, rather than an attendee. I didn’t really feel like there was much of a difference between me and the talented writers we were presenting to, but I had a wonderful time. I got to participate in a big group panel, and then a smaller session with Emily Wing Smith, Sara Zarr, James Dashner, and Wendy Toliver. After that, I guided a critique of first pages with several soon-to-be-published writers. I was quite impressed with the quality of storytelling in those pages (like I said, not much difference between me and them). I hope I said some helpful things. As a fundraiser, the event was very successful. The museum raised $8,000, which will be used to put books in the hands of kids, and Deseret Books donated a sizable portion of that. As a workshop, the feedback from attendees was very positive. The mood was light and supportive, and everywhere there was a real sense of community. 1 – Getting a cool mini harmonica from the Treehouse Museum. It’s what their volunteers wear. 3 – Using a commonly accepted expression for bad first drafts, which contains a swear word, in front of a group of attendees, getting some laughter and also possibly scandalizing the grandmother of one attendee. 4 – Seeing my friend DaNae there, who bravely stepped out of her comfort zone and brought her picture book manuscript for critique. Go DaNae! 5 – Assisting Brodi in reenacting the time a woman hit on her at the SCBWI conference in LA. You see, Brodi was dancing at the Blue Moon Ball and… wait, you know what? She tells it much better. 6 – Having dinner afterward with a group of writers I admire, and realizing that I’m pretty lucky to be a part of this community. To cap things off, here’s a picture that was taken of all the presenters. I was recently browsing in a book store, and couldn’t help overhearing the conversation between a mother and her teenage daughter right next to me. The daughter was looking for a new book to read, and her mother was offering guidance on the titles she thought would interest her daughter. The daughter picked up Jane Yolen’s The Devil’s Arithmetic. That’s an amazing book, I thought to myself. The daughter looked down at the book. “Do you know about the Holocaust?” the mother asked. “You don’t want to,” the mother said. She took the book from her daughter’s hands and placed it back on the shelf. I was speechless. I may still be, but I’m going to attempt to gather my thoughts and respond to this experience here because it involves both history and literature, and those are two subjects I’m pretty passionate about. History first. I know that most everyone has heard the saying that “those who forget history are doomed to repeat it.” But sadly, that’s become a white-noise aphorism in spite of that fact that it is very, very true. Making sure that no one remembers the Holocaust is a precondition to perpetrating it, or something like it, again. We cannot allow those events to be forgotten. Understanding how Hitler was able to marshal an entire nation and incite such violence and hatred is critical if we are to safeguard our society against such men in the future. Hitler’s genocidal campaign against the Jewish people and his war against Europe did not spring up overnight. Those “final” atrocities represented the culmination of years of calculation, strategy, and propaganda. The record of Hitler’s social, political, and military agenda offers us a thorough list or warning signs if we choose to look at it. Averting our eyes from it because it is uncomfortable is simply not an option. But that is exactly what the mother in the bookstore chose to do. Which brings to me literature. 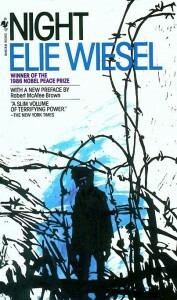 One of the greatest books I read in high school was Night by Elie Wiesel. In my English class, we were given a list of books to choose from and, unlike the mother in the book store, my parents encouraged me to read Night. They took me to the bookstore and bought me my own copy. Night became a defining book in my development, one of the greatest lessons I have ever received on the potential for evil in this world, and our potential to rise above it. I must put aside the fact that a teenage girl did not know about the Holocaust (the failings of our education system could be the subject of innumerable blog posts). What concerns me more was how her mother saw this very wide gap in her daughter’s knowledge of the world and chose not to fill it in, but to protect it. And assuming the best intentions, that’s probably just what that mother thought she was doing – protecting her daughter. She undoubtedly wanted to shelter her child from at least some of the ugliness and brutality that exist all around us. But what would happen if an entire generation of children knew nothing of the Holocaust? 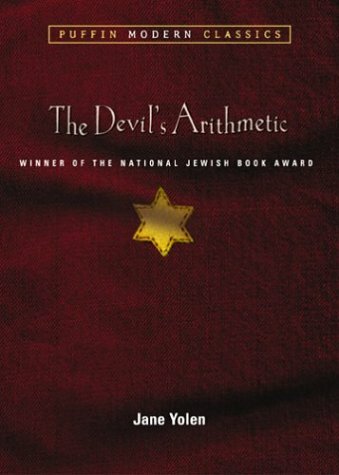 The irony, of course, is that The Devil’s Arithmetic is about a modern girl who is taken back in time to bear witness to the events of the Holocaust so they will not be forgotten. Contrary to how it might sound, I am not saying that this mother should have bought Yolen’s book for her daughter. It is a parent’s right to determine what their child is ready for. I know I certainly would have made a different decision, like my parents did for me. What better way to introduce the Holocaust to a teen than a YA novel written by one of our greatest living storytellers? But that teenage girl is not my daughter. What I am saying is this: that mother absolutely should have found a way to educate her child. A different book perhaps, if she did not find The Devil’s Arithmetic appropriate for some reason. But she should have done something. I know from my own experience how enlightening books can be, especially in dealing with some of the harsher aspects of life. The Holocaust was and is something so evil as to be incomprehensible to me, but Night helped me to at least partially grasp those events. More importantly, Night helped me to understand what I could learn from those events without living through them, myself. That is the power of books, and at times, the history they contain. This is interesting. Psychologists Nicole Speer and Jeffrey Zacks conducted a study of reading using functional magnetic resonance imaging (fMRI). Basically, these researchers used imaging technology to look at what our brains are doing while we read a story. They found that some of the same regions of the brain are active for the reader as would be active for someone actually experiencing the events in the text. In other words, our brains create simulations of what we’re reading, a virtual reality of our own making. Reading really can take you someplace else. And it lets you experience something you otherwise might not. In some cases (historical fiction, for example), a book is the closest we can get to the real thing. This is something librarians and teachers have been telling young readers for a long time. This is something familiar to anyone who has ever been brought to tears by a book, either of laughter or grief. Anyone who has ever been brought to their feet by a character’s triumph and victory. Anyone who has ever been reluctant to turn out the light and chills at strange noises in the dark. This is something that anyone who reads can relate to. These findings also suggest that reading about a fictional thing might actually prepare us for the real deal should we ever encounter it, providing evidence for how profound and transformative the experience of reading can be, perhaps even altering the structure of our brains in a manner similar to the way a real experience would. Science has shown us that what we read really can become a part of who we are.